Doc kicked off the Philly Beer List tasting notes with his excellent write-up on the rare and tasty Duvel Green. I’ll try to get some quick-hit tasting notes up in the next few days before my memories from the Philly trip completely fade away. Let’s start with the first beer I drank on the trip. After arriving at the hotel, dumping off my bag, and meeting the Prof and Magnus, we raced over to Monk’s for a pint. 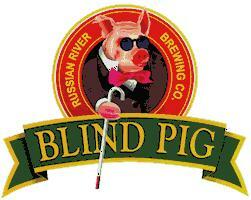 The front bar had Russian River’s Blind Pig IPA on tap so the first round was on me…Blind Pigs for everyone! Russian River has become synonymous with super-hoppy, carefully-crafted concoctions. Their Pliny the Younger is the only beer to have replaced Westy 12 as the #1 brew on BeerAdvocate’s Top Beers list (though it was quickly bumped back to #2 after a few days). And their Pliny the Elder is the Double IPA by which all others are measured. Their beers are consistently rated amongst the best in the world and many knowledgeable Aleheads consider them the finest brewery on the West Coast if not in the country. While the Plinys tend to get most of the press, Russian River makes a wonderful standard IPA as well. Named for the Blind Pig Brewing Company where Russian River brewmaster Vinnie Cilurzo cut his teeth, the Blind Pig IPA was expertly poured by the Monk’s bartendress. A lush, pure-white head topped a glowing, golden body. The nose is quintessential West Coast IPA. A perfect aroma of grapefruit, lemon zest, and pineapple with just enough malty sweetness to hold everything in check. The taste is big and bold…huge bitter hoppiness on the front end followed by a kick of robust, pale malt and a thirst-quenching, clean finish. Drinkability depends on your love for hop-bombs. As long as they’ve got enough malt character, I can drink hop-bombs every day of the week and twice on Sunday. 3.5 Hops from me…would be 4, but I’ve had the Pliny so I know that Russian River can do even more spectacular work with the humble humulus lupulus. A great start to a beer-fueled weekend. Lots more notes to come! Posted in Tasting Notes.Tagged Blind Pig, IPA, Monk's Cafe, Philadelphia, Russian River. Here’s the problem with epic beer trips. I would give my left nut (Not the right, that one’s special) for a sip of anything that Russian River could push in front of my face. How on Earth, having walked past the front bar at Monk’s on three separate occasions, did I miss this Russian River offering? That’s not really the problem with epic beer trips though. The problem is that I could very well have sampled this brew, yet so many other beers would pile up that I wouldn’t be able to remember it. Wait, is that a problem? Let’s start planning the next epic beer trip!